255 Rutherglen Road, Gorbals, Glasgow. The Kick Off was situated at the corner of Rutherglen Road and South Wellington Street which was later called Lawmoor Street. There has always been a pub here since the tenement building was erected around the late 1700s. Exterior view of the Kick Off 1959. This image of the Kick Off was taken in 1959 when Helen McGhee, 58, was stabbed to death in her wee baby-linen shop in Cathcart Road in April of that year. Her killer was a butcher boy John McGilvray, 17, from Cambuslang. He was drinking in the Kick Off bar when the police raided the place and caught him drinking at the bar. Fingerprints were found on a copy of the Evening Times newspaper which linked him to the murder. He was jailed for life. This old pub and tenement building was demolished shortly after this image was taken. John Meikle jun a well known and respected spirit merchant owned the pub from 1891, he took over from his father, John Meikle who started out in the licensed trade in 1874 in a small public house on Portugal Street. 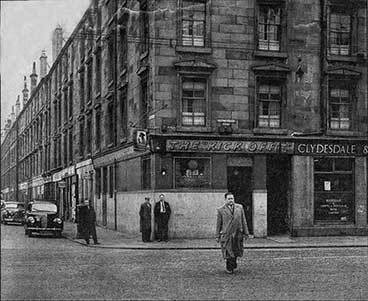 The family went on to owns other well known pubs in the city including J Meikle, Paisley Road West and Eglinton Street. J Meikle's premises 138-40 Paisley Road West at the corner of Eaglesham Street. 1935. John Meikle senior was born in 1826 in Muiravonside Parish, Stirling. Mr Meikle met his wife Jane in Bothwell where they started a family, they soon moved to Glasgow and settled in South Apsley Place, Gorbals. The happy couple had three other children there, the eldest was Agnes, John, Jane and Robert. John jun learned the trade as a commercial traveller with a silk firm while Robert was a commercial clerk for a grain business. The family then moved on to better accommodation in Abbotsford Place. 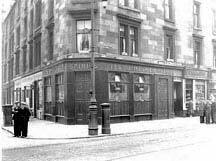 After the First World War John jun was running three pubs in the city which included Rutherglen Road, Paisley Road West and Eglinton Street all having the title J Meikle above the doorway. The family continued to run the Rutherglen establishment until the early 1950s. Another well known publican to own these premises was Joseph McCabe, the pub closed it's door for the last time in 1959. The City Council demolished the pub shortly afterwards along with other landmarks in the area. Joseph McCabe then went on to own the Forum, Kelso Street.